Craig Newmark: Gutenberg was a geek (I prefer “nerd”, being one) whose work invented our current day, much like our work together on the Internet is defining the future. Jeff does a great job with the story of Gutenberg, correcting misconceptions including my own, and then show how it relates to Silicon Valley entrepreneurship and its context in evolving world history. This is a really big deal, beyond my ability to articulate. Rex Hammock: (My only disappointment: He should have named the ebook What Would Gutenberg Do? in reference to his previous book, What Would Google Do?)…. In Jarvis’ compact and concise book, he fills it with inside-geek references to today’s era of new technology and new business models built on that technology while revealing that others have gone down this path before — hundreds of years before. I feel certain no one else has written a book of any length that finds parallels in how Gutenberg and the founders of Airbnb.com funded their startups — but it’s that kind of informative, and fun, comparison that enables this to be an informative, but quick, read. Walter Reade: I listen to Jeff Jarvis every week on the “This Week in Google” podcast. He drives me crazy 80% of the time. But, he’s worth listening to the other 20%. Jeff is not afraid to think. He is not afraid to weave narratives and create hypotheses from observations from the modern world and from the world of history. He has a relentless habit of extracting meaning from events and trends, and expressing it is ways that make me think. Gutenberg the Geek is a wonderful example of Jeff’s style of thinking. The “Kindle Single” is worth reading simply as a summary of the life and accomplishment of Gutenberg. It is an important reminder to us how Gutenberg worked for years to achieve what he did. He didn’t wake up and invent the printing press. He perfected his craft improvement upon improvement, while at the same time wrestling with the challenges of life and business. If you’re so inclined, though, the book will also give you a major serving of food for thought. In short, can we afford to stifle the modern-day equivalent of the printing press (i.e., the internet), because it too, like the printing press, is disruptive to various powers that be? Jeff raises those questions quite eloquently. “Don’t today’s entrepreneurs dream for a fraction of Gutenberg’s impact? He was the inventor of history’s greatest platform.” A good quick read, stylistically somewhere between a Wikipedia entry and an article in WIRED. I’ve just published Gutenberg the Geek, arguing that the inventor of printing was our first geek, the original technology entrepreneur. I find wonderful parallels in the challenges and opportunities he faced and those that face Silicon Valley (or entrepreneurial journalism) startups today. So I retell his story from an entrepreneurial perspective, examining how he overcame technology hurdles, how he operated with the secrecy of a Steve Jobs but then shifted to openness, how he raised capital and mitigated risk, and how, in the end, his cash flow and equity structure did him in. This is also the inspiring story of a great disruptor. That is why I say Gutenberg is the patron saint of entrepreneurs. The Kindle Single came out of my obsession with Gutenberg that developed while I researched Public Parts. I also wanted to learn how Kindle Singles work (more on that later) -… and prove that I have nothing against charging for content! But I’m not charging much, only 99 cents (free in the Amazon lending library). Tomorrow, I’ll link to an excerpt from the piece. I’d be honored if you bought the piece and said what you think here or at the Amazon page. …The reader works wonderfully for books. But it also tries to turn a newspaper into a book, starting us on the first page of the first story and nudging us through its awkward user interface to proceed a page-turn at a time through the entire product, as we used to on paper. The digital among us, however, no longer read news in this way. Online, we search and link and flit and explore. We are in control of the experience, not some editor somewhere. Online, news has been freed from its packaging. Indeed, that is a key architectural underpinning of the web itself: content is separated from presentation. The same text and media can be fed into a web page, or into an iPhone app or an RSS feed. Substance parts company with style. . . .
We care less about the form of news and more about the information it imparts. That is the key strategic problem for editors and publishers hoping to charge us online: once news is known, it is knowledge that can be spread through conversation, which means it can no longer be controlled behind a pay wall. News is spread in the speed of a tweet. The half-life of a scoop’s value is lessened but the value of links grows. . . . But in news, neither the device nor the form matters nearly as much as the information and its timing. This requires that publishers unleash their news on every device possible. But no single gadget will be their saviour. None will bring back the good old days – if they were that – of news and the world delivered in neat little packages we paid for. I was wrong about the Kindle. When I unboxed it two nights ago, I excitedly bought my own book to feel all cyber and tweeted about it. But the book wouldn’t show up. “Opening,” it said forever. Two hours went by and I called Amazon (which – new for them – made the phone number easy to find and answered it in a minute). The lady said the modem had to be fully charged. That made no sense; it would mean essentially that it would never work unless plugged in. But, fine, I waited for the green light. Still no book. Two hours more. I called Amazon again. The man said it must be a defective unit and he nicely said he’s ship a replacement (this is why I am happy I have Amazon stock). I chronicled my frustration on Twitter, and word passed around there. The next day, I tried the Kindle in Manhattan and it worked fine. Two more tests verified that the problem was not the Kindle but Sprint, which was never great at home when I had a Sprint Treo but would at least work. Now, it took more than four hours to download a book and even going to a new store menu page takes minutes. I confessed my mistake on Twitter and shifted blame to the phone company. Sprint monitors Twitter – that’s the good news – but they might as well not, as the Sprint guy merely tried to sidestep responsibility, saying that there wasn’t a network outage (I didn’t say there was) and shifting blame back to Amazon: “Spoke 2 @Sprint Care, Retail. Kindle issues should go 2 Amazon customer care.” Amazon should learn to pick its partners more wisely in the future. And I need to learn to cram caveats into tweets when I have problems. So now I have a Kindle that works in some places, not others – and not working at home may be a killer. This is why I wish it came with wi-fi, or at least the option (especially for when I travel overseas). I prefer my control of communications on my iPhone. But then the problem with the iPhone is also that it has to be connected; I’d like to download content – such as the New York Times – to it so I could read the paper on the train. So I’m undecided about the Kindle. Its organization is still inelegant to say the least. 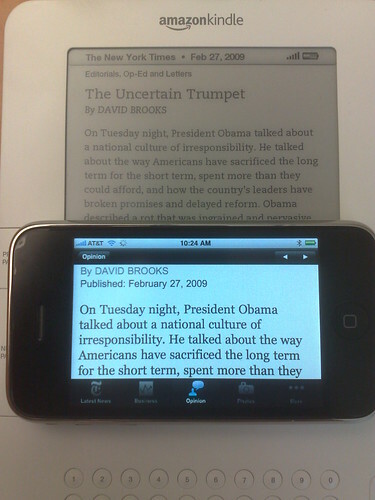 For example, when reading the Times, it wants me to go story-by-story – that’s bookthink. I want to see the menu of articles in a section. But when I then go to an article and page through it, to get back to that section listing, I have to go back to the top and then back to the section. When reading a book on either device, I miss easy ways to thumb through. If I traveled a great deal and took books with me everywhere – which I don’t – the Kindle would clearly be a godsend. And maybe it will make me start traveling with books – and reading them – more often, as the web has been bad for my book reading habits. But I’m still not sure. I also wish that the business model of book publishing were different: that I could buy the contents of a book and get it in any and all media: I could read it on paper when I’m home and on Kindle when I’m on the road and listen to it on my iPhone when I’m driving. I disagree strongly with Roy Blount Jr.’s assertion on behalf of authors (other than me) that the Kindle shouldn’t be reading books aloud to readers because it would cannibalize audio-book sales. This assumes that people who buy the print book also buy the audiobook in great numbers and that having a book read by the computerized and irritating voice of a Kindle will hurt sales. No, I think a book should be sold as a package: buy access to the ideas and get them however you like. I think that would spur greater sales. The next step is to move past selling books as a product, frozen in time, and start selling them as a process. But that’s a post for another day. I’m holding onto my Kindle for now. I was wrong about it at first blush and so I need to give it more of a chance.